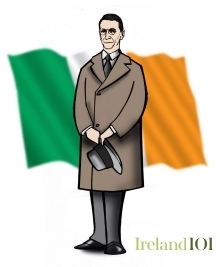 Éamon de Valera was born on the 14th of October 1882 and died on the 29th August 1975. He was one of the dominant political figures in 20th century Ireland. His political career spanned over half a century, from 1917 to 1973; he served multiple terms as head of government and head of state, and is credited with a leading role in the authorship of the present-day Constitution of Ireland. Keeping the peace with Britain, De Valera used military tribunals and the newly created Army Volunteer Reserve to thwart efforts of both the Irish Republican Army and the Army Comrades Association during the 1930s. Assessments of De Valera's career have varied; he has often been characterized as a stern, unbending, devious, and divisive Irish politician. Biographer Tim Pat Coogan sees his time in power as being characterised by economic and cultural stagnation, while Diarmaid Ferriter argues that the stereotype of De Valera as an austere, cold and even backward figure was largely manufactured in the 1960s and is misguided.